Moons, stars and colourful paintings hang in threes on uncluttered white walls, revealing the soul of an artist. 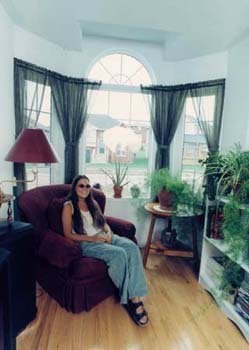 Lush ferns flourish in the bright bay window sun, divulging a love of the earth. Subtle music insinuates its way into every corner of the home, exposing the sensitive nature of its gentle owner, Elaine Lally. The author of the poetry collection “Petals of a Daisy” devotes volunteer time helping school children learn to read and develop self confidence in her hometown, Port Perry, where she purchased a brand new brick bungalow. Elaine’s move into Alliance Homes’ neighbourhood at Seasons of Lake Scugog symbolized a critical step in independence for the then 26-year-old, who had spent much of the previous six years in hospitals or largely dependent on others. The young woman’s life changed drastically in September, 1993, when she was involved in a serious automobile accident in Winnipeg. Thrown 33 feet from the vehicle, she sustained a traumatic closed head injury that left her in a coma for three months, and in hospitals until June, 1994. Initial medical opinions were that she wouldn’t walk or talk again, and that she would eventually go blind. Today, her gait is awkward, but she walks on her own with a cane and has regular help with housework and transportation. The extremely well spoken writer has vision problems and some memory challenges, but her unstoppable strength gets her through everyday life, and helps her cope with grace. The decision for her to live in her own home carried with it a variety of specific requirements. She and her family knew that they’d have to seek out a special builder – a company open to creating more than a production home for someone whose life doesn’t fit into a typical mould. Alliance Homes responded with enthusiasm. “They’ve done everything I’ve asked for,” says Elaine, whose home, The Doral, features hardwood flooring, because she finds it easier to walk on than plush carpeting. Walls, counters and ceramic floors are white, because she is able to see objects against them more clearly. The stairs to the young artist’s loft have a double railing, which helps her ascend to the computer area where she writes. Her bathtub includes jets that stimulate her often poor blood circulation, plus a safety bar. The easy-entry shower in her ensuite is also handy, as is her automatic garage door opener and main floor laundry room. She loves the gas corner fireplace in her great room, which opens onto the deck with sliding glass doors, allowing plenty of natural light to flood her casual living area. And Elaine Lally’s right – in Port Perry, friendly residents appreciate a village lifestyle where people stop and chat on the street, and where local merchants know you by name. Just 20 minutes north of Oshawa, Port Perry is drawing more and more families who appreciate its tranquil small town lifestyle.